I’m going to admit it right from the get-go. This post is definitely a pre-emptive explanation of what happened just a few days ago should anything come of it, and it’s also a musing about some of the hearse and funeral home going’s on as of late. Last weekend, my wife and I volunteered to do some community service work and helped a lady clear out all of the junk in her yard that had been amassed over decades. She’s 99, and despite the fact that she is an absolute spitfire, carting cinderblocks and broken planting pots out of her backyard wasn’t in the cards, so we came in to help clean things up for her and her family. It was fun for all of us and it was fantastic to see how much progress was made. Sun and some hard work makes for a fun Seattle springtime. Now, this post isn’t about patting me and my wife on the back. Quite the contrary, it’s more of a facepalm/groan story about how I’m an absolute idiot. 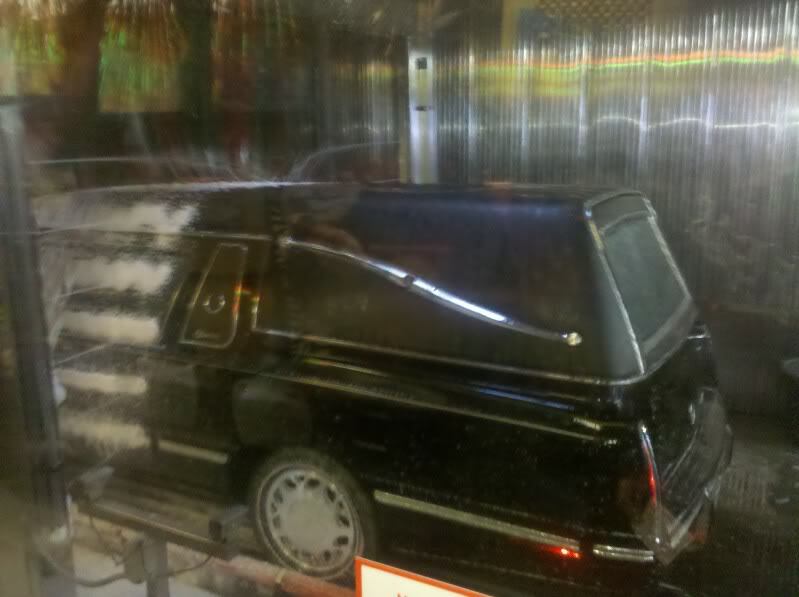 We came over with the company van, which had Elemental Cremation & Burial graphics on it. We lined the back with some blankets and filled it up with the broken concrete, pots, and other unsalvageables to take to the transfer station, otherwise known as “The Dump”. It wasn’t until I pulled up to the cashier to get our weigh in card that I realized, by the look on her face that this was probably an ill-fated and foolish move. I rolled down the window and said “I swear, it’s all landscaping garbage…” with a big grin. We joked and I rolled on to the pit to offload my pots and concrete. We were just getting back into the van to head out when a guy pulled up squarely in front of us and pulled out his camera to snap the funny/damning/incongruent photo of a funeral home van at the dump. My heart sunk and in its place my stomach headed for my throat. All I could muster was a huge ear-to-ear smile and a wave for the picture – because at that point… you’re screwed. Like many businesses that have a sensitive nature, you are always under the watchful gaze of the public. It may not be a laser focus like some industries have to endure, and at the same time, a misstep like this can be completely destructive, no matter what the explanation. And I don’t think that it’s unreasonable. Should we be held to a higher standard than say, a fast food restaurant or a convenience store? I would argue that yes, we absolutely should. Here’s why. But what of the more common vehicles that we drive in our profession? What about the courier’s Prius or the mini-van that has graphics on it? There are many legitimate uses for these cars that would escape the casual observer’s frame of reference. None of which would be untoward if people only knew the reason and function of it. Transporting new arrangement room chairs from a furniture store or taking bags of shredding material to Iron Mountain. Picking up catering for the company picnic or hauling flowers from the nearby florist. Or in my misguided case, taking garbage to the dump. The truth is that the vehicles should probably never be used for such things, because perception becomes reality very quickly. This is unfortunate because in some ways it raises the costs to the end consumer if it requires a provider to get another vehicle that can perform those duties. More importantly, and sad in my opinion, is that the good things that a funeral firm would otherwise do, they may be less inclined because of the scrutiny that they are under. Ultimately, we got home and got to the business of doing the only option that I thought was right: removing the graphics from the van. I’m not about to stop doing things that I believe in and using the tools at my disposal to make this planet a better place because circumstances are misunderstood. The cost is that people won’t know that we’re doing it, and I’m alright with that because the cost of people thinking that we’re doing something wrong is WAY higher.